Two years or so have gone by since I first started dreaming up my layout. So, where am I at now with it? Have I finished it and incorporated all of my Must Have and Would Like items? Or, am I still constructing and in need of some inspiration? 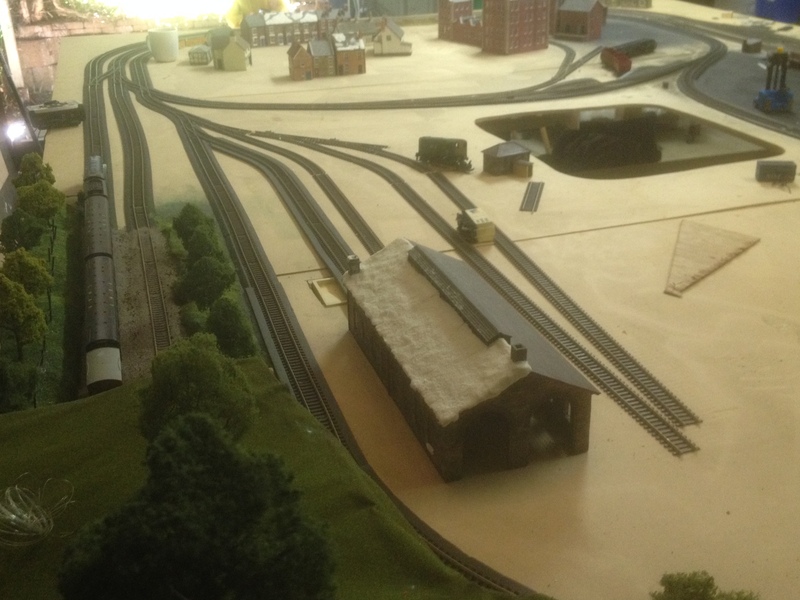 Well, if you read my first blog that would have given it away – I have partly laid track and some scenary. I have modellers-block. Too much to do, so many ideas and not knowing what to do next. As you may be able to gather, I am also an avid Mansfield Town supporter, but please don’t hold that against me. I have never been known as a glory hunter. Anyway. When I get around to it I plan to put some boarding (or similar) onto the sides of the shed to make it a little more appealing. If anyone can let me know their thoughts on background scenes that would be great. I see plenty of them around, however I’m not sure whether they add or detract from the realism of the layout. I guess it depends on making the right choice of scenic landscape and not just going for a generic rolling hills? You will see that the layout is split into three baseboards each with its own set on a pretty basic but (hopefully) very sturdy base frame and set of legs. A testament to this was when I was working on some track work and my kids decided to climb through the central well and crawl around on top. My heart may have missed a beat and yet the layout is still standing. Job done. Clutter under the table will be removed when I seriously get around to wiring up the points, lights and all. Before which, a good session of pest spraying (mainly spider removal) will be in order. This is something I would not have given a second thought to if I were constructing my layout back in England. However, Australia is home to crocodiles, sharks, snakes, jellyfish, mosquitos… and spiders – look up “Redback spider” and you will see who I am sharing my shed with. Don’t get me wrong – no spider, redback or other, is going to get in the way of me and my choo-choos. You will see that most of my time to date has really been spent on this back section. I had envisaged working from back towards the front. I am now thinking to keep the momentum going I need to see progress on a sections of the layout, no matter how small. This may not be the way to go, and I may change my mind. I perhaps need to finish each one of the main features in turn before moving onto the next one, then filling in the gaps, with trees, scenary and all the other things which make the layout great as opposed to just good. There is no time limit to getting this finished so I guess there are no real excuses for cutting corners. I would however like to finish it (albeit with a continuous bit of tinkering) in the next few years. Here’s hoping. I can then get on to planning my garden railway. Hmmm. Slow down. Twin track mainline with long straights. In. Power and points need to be finalised. A mainline station. In. Some work involved as I plan to make this a big feature of my layout. A tunnel. Installed. Realism now to be added. Anyone know how to weather brick work? A signal box and level crossing. Signal box has been purchased but I’m not totally happy with it so plan to get on ebay in the coming weeks to upgrade. Any recommendations? Level crossing to be added once other scenary has been laid. A single track branchline. It has a place but has yet to be pinned down and finalised. Links mainline to town to brewery to goods yard. Central well. Cut but a work-in-progress. It allows for broad shoulders, or kids who want to nosey around the goods yard and back of the station. Electrified points. In progress. Using DCC Concepts point motors, levers (which look really authentics and are a great product) and harnesses – I’m not yet proficient in electronics so these are very handy and save me time to do other stuff. Steam era loco sheds. 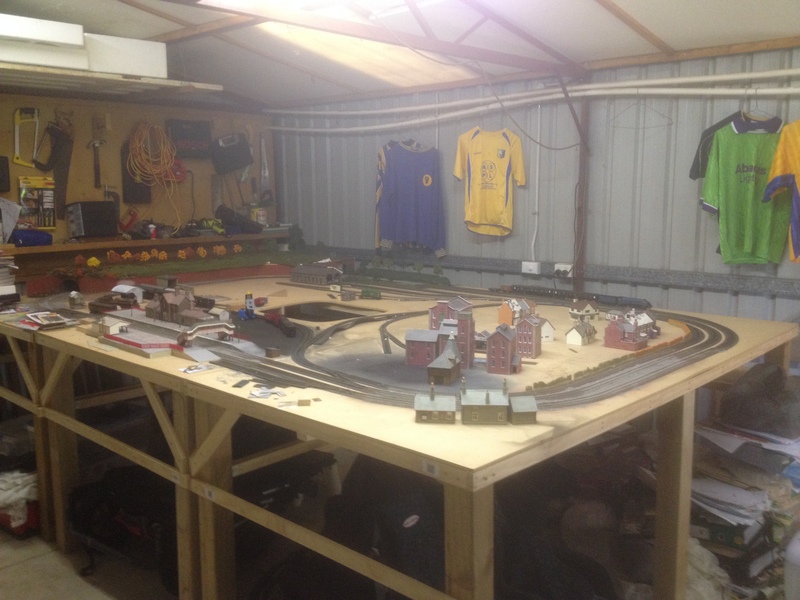 A bit of internet research and I found a fantastic shed (Bachmann – The Model Centre). It ain’t cheap, but quality generally costs. A goods yard with at least six decent length sidings. I have the space, but have only the start of the sidings. Expect to have points galore which is scaring me a little thinking about the cost of points, levers, motors and the like. Back to AnyRail for a bit of trial and error me thinks, and I’m sure this may end up being one of the last things done on my layout. A brewery. Chose to go for the Metcalf cardboard range as opposed to Bachmann. Good range and think it will just do nicely after a bit of weathering. Coaling facilities. I have purchased a couple of items but not sure if they will fit into the layout. Ash removal facilities. Purchases have been made. Painting and installation now required. Coal merchant. Bought a great Ratio kit and have been taking my time (yes, it’s a trend of mine) to construct and paint to a decent standard. Can’t wait to have this sitting on my layout when it’s finished. Space to model a village – shops, a pub (or two) and housing. There is plenty of space allocated to this gem and I have already purchased a few houses, shops and pubs. I haven’t yet planned the village properly, so my purchasing in this department has now ceased for the time being. I will endeavour to do a post on each item in more detail. Much easier than trying to get everything discussed in one hit, but spending weeks writing it up. I’d really like if readers can post comments, queries and the like as I go as I think this will be more beneficial. I can then consider (and possibly implement) your suggestions now rather than months down the track, so to speak. Nice work Gaz….. Keep on plugging away , little by little , bit by bit. Before you know it you’re gonna need a bigger shed… Speaking of sheds … Looks a truckload cleaner than the last time I was in it. See… Progress already ! As you may have seen from your visit, and from the photos I have posted to date, I am in desparate need of a workbench. I have been doing most of my work on one of the corners of the baseboard which is not ideal. Everytime I use a saw it’s like a miniature earthquake is hitting the layout. I will soon be getting complaints from my little plastic and lead people for sure. If the offer is there, I may take you up on getting your assistance with constructing a workbench. And, after the clearout, there is now plenty more space. Yep…. Let me know when you want to knock one up.. I’m free all week. Shouldn’t take more than a half day to build one.